A new year is always the best time to start a new weight loss plan and create healthy eating habits. But without an actual plan and strategy in place, your plans might just stop after a couple weeks. And that’s why I’ve decided to look for some ways to help you achieve your new year’s goal; healthy eating. These tips and tricks will help you stick to healthy eating habits long term. Plus they are all easy to do, so check them out and let me know what you think. We all know that breakfast is the most important meals of the day. And adding veggies to your breakfast can make you healthier and more productive throughout the day. Loaded with tons of vitamins and nutrients, you can’t go wrong. With busy days and hectic schedules, you tend to rush and have no time for anything. And when you have time to get a bite, you gobble it down. This results in an unsatisfying meal and unhealthy eating. But this should not be an issue anymore when you can just eat slowly and enjoy your meal. It takes around 20 minutes for the stomach to send signals to your brain that it’s full, so this is also a good reason to eat slower. You’ll feel fuller and be eating less. Fruit is an important part of a healthy diet. Not only does it give you a lot of nutrition, but it also decreased the chance of having diseases. So eating at least two pieces of fruit a day can help you out a lot. Try substituting fruit in for other unhealthy desserts. Okay, this may sound silly but going into a grocery store starving is not a good idea. If you haven’t eaten your lunch before doing your groceries, you’re more likely to choose high-calorie foods and junk food that’ll satisfy your cravings. Need more reason to ditch eating out? It’s expensive, distracting, unhealthy, and will totally ruin your fitness plan. While it’s tempting to eat out, dining in your home helps you to lose weight. You can control what you’re consuming and make sure that you’re serving a fresh, healthy and tasty meal for the whole family to enjoy. Honestly, you’re likely eating sugar throughout the day without noticing. 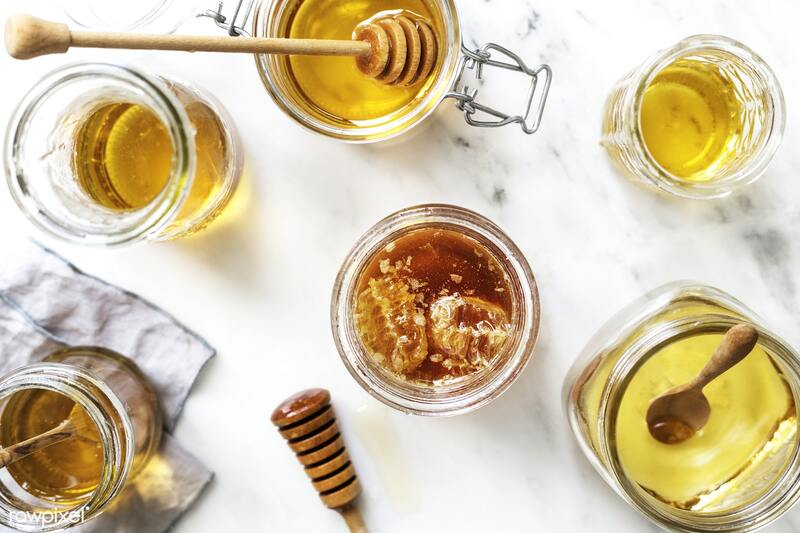 So to gradually cut down on sugar intake, use alternative sweeteners like organic honey to your food. Another way to reduce your sugar intake is by buying unsweetened or no sugar added products at the grocery. Added sugar is most common in dairy products, canned fruits, juices, and condiments. Getting treats out of your sight and off your countertop can help you out a lot. If it’s within arms reach, chances are you’re more likely to consume them and want more. Replace them with a fruit bowl or healthier snacks to keep yourself on track. Whether you’re a mom, student or working full-time, it can be hard to cook all of your meals at home each day. That’s why having a meal plan for the entire week can save your sanity. A weekly meal plan can help you eat better, save money and time during the week. While a good shopping list is key to a quick and painless trip to the supermarket, a well-stocked healthy pantry is the best way to keep your healthy eating habits. Stock up on fresh veggies and fruit, cut them, freeze. You can also store canned tuna, oatmeal, olive oil, beans, nuts and all diet friendly products that will help you stick to healthy living. By finding other alternative ways to cope with stress, you’ll slowly stop turning to food for comfort. So try reading some good books, start cooking, run, or whatever hobby you want to do to unload stress from your body. Whether you’re planning to be healthy or want to upgrade your fitness plan, these tips and tricks have got you covered. Just be mindful that it’s a long term plan you need to stick to so you can see great results. Now, if you have any questions about these ways of eating healthier, let me know in the comments down below. I’d love to help you out.